It’s a wrap! I successfully finished our One Room Challenge master bedroom makeover JUST in time for today’s reveal. 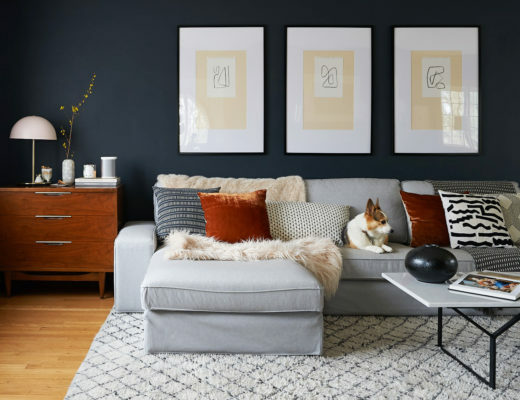 If you’re not familiar, every spring and fall, 20 featured designers selected by the ORC team participate in a 6-week challenge to decorate one room. The event is hosted by Linda Weinstein of Calling it Home and Better Homes and Gardens. In addition to the featured designers, hundreds of other folks with blogs (and Instagram this season!) 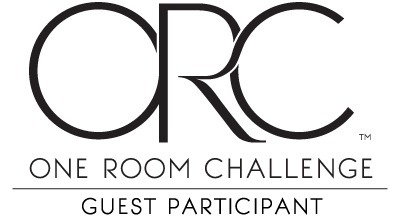 join in on the challenge as Guest Participants <— that’s me. These last 6 weeks flew by and I am so happy with how much we accomplished. 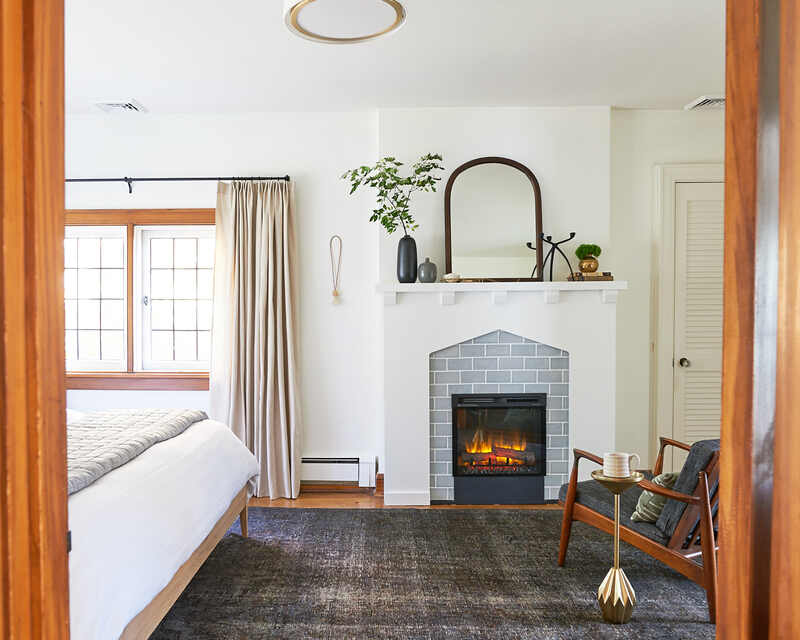 I can’t stop smiling at the fireplace I built with my dad – it’s the focal point in our the bedroom and I love it. And upgrading to the most beautiful king size white oak bed has been amazing. Ok, let’s take a quick look at where we started and then I promise we’ll get to the good stuff! 6 weeks ago our bedroom was cute but under-furnished. We had a queen size bed paired with mismatched lamps and nightstands and art hung just a little too high. The fluffy shag rug was great underfoot but not easy to keep clean. Our Dyson had trouble handling it and our new Roomba, Clementine, wouldn’t even try it. The room had already come a long way from what it looked like in the listing photos and from when we moved in. We had the floors refinished, removed a chair rail, and painted the walls Benjamin Moore’s Simply White in matte. Our master bedroom was also much improved by switching out a frilly chandelier for the Cedar & Moss Conifer Flush Mount from Rejuvenation. This was the view looking into the room. 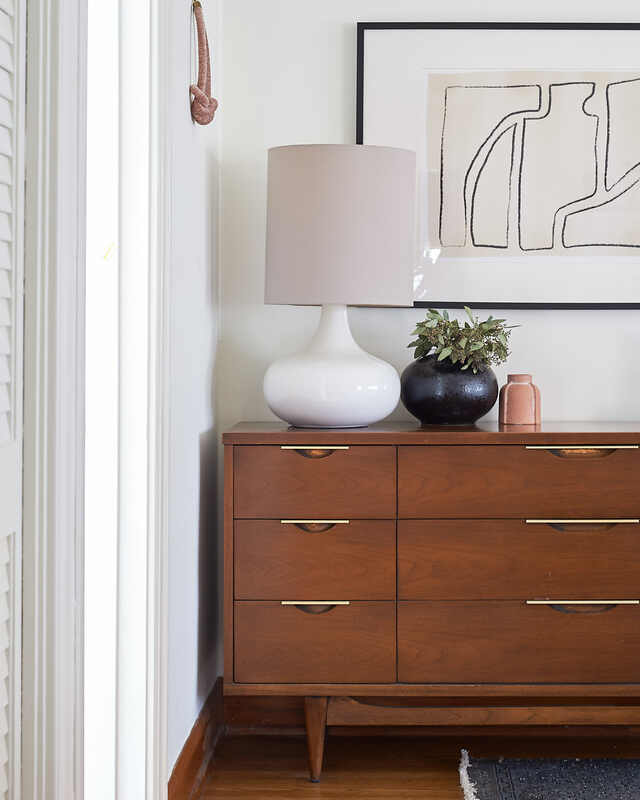 I had a small 3 drawer mid century dresser that I still love and haven’t been able to part with. The dresser and mirror combo is nice and all but I couldn’t help but wonder, what if it was a fireplace instead? This view! I love it so much. I’ve always dreamed of having a fireplace in my bedroom so my big project this season was building one! I designed a fireplace surround that was a modern nod to the craftsman and Tudor style of our home. My dad and I spent about half the challenge building the fireplace on weekends (plus some weekdays my dad gave up to work on this solo because he’s the best). I picked a pale blue irregular tile with a crackle finish that mimics the original tile in our blush bathroom. 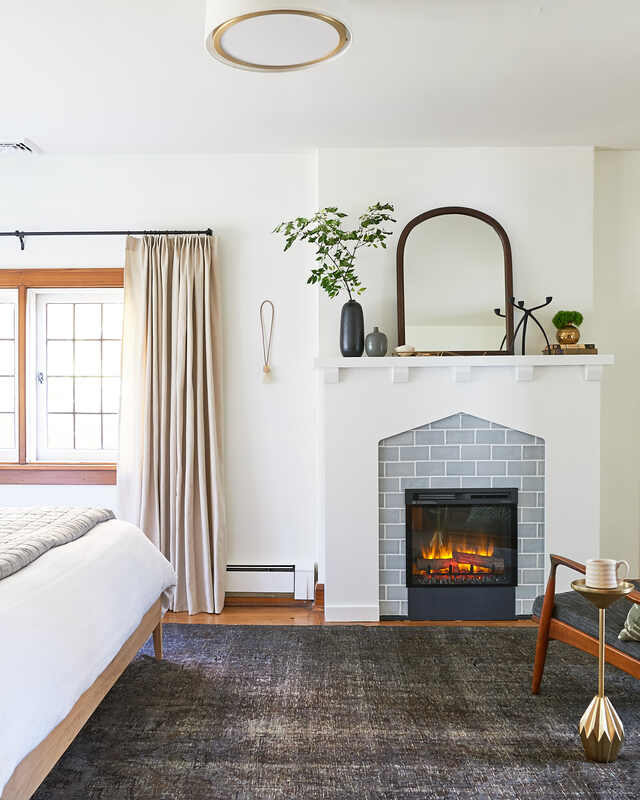 The fireplace is painted the same color as the walls, Benjamin Moore’s Simply White, in a satin finish rather than matte. I added a midcentury chair from our living room and small drink table to create the perfect spot to enjoy a cup of coffee while basking in the heat of the fireplace. I originally planned on adding art above the fireplace but at the last minute asked Andy to lean this arched mirror on the mantel instead. I picked it up at a thrift store almost 10 years ago and it used to hang in the entryway of our apartment. You may recognize it from my Pinterest-popular SVALBO hack. 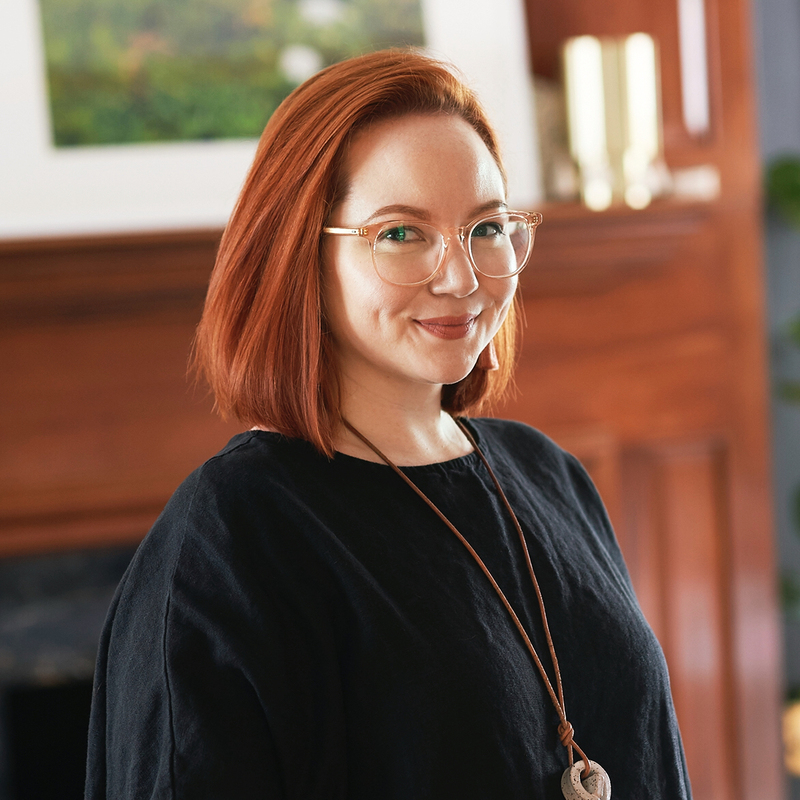 I styled the mantel with my favorite gray vase from Pittsburgh-based ceramicist Bombabird along with a vintage brass vase, a candle holder from CB2, and a vase and tray from Target. I clipped a branch from a tree in our yard and popped it into a vase to add the perfect touch of greenery. For the electric fireplace insert, I chose a 23″ insert from Dimplex. It acts as a space heater with the added ambiance of a fire. I can control the temperature and the robustness of the flames via remote control. I like that I can choose to just have the flames on without the heat for warmer months. If you are thinking about adding an electric fireplace to your home, I have a few pieces of info for you that I learned during this process. Electric inserts like these can be directly wired or plugged into an outlet. Essentially, electric fireplaces are just fancy space heaters and space heaters like this should be on their own dedicated circuit for safety. If you have an older home like ours, you may not have grounded, 3-prong outlets and that’s also a problem. We are addressing these issues with an electrician and won’t be using the fireplace for heat until we have a safer electrical solution in place. 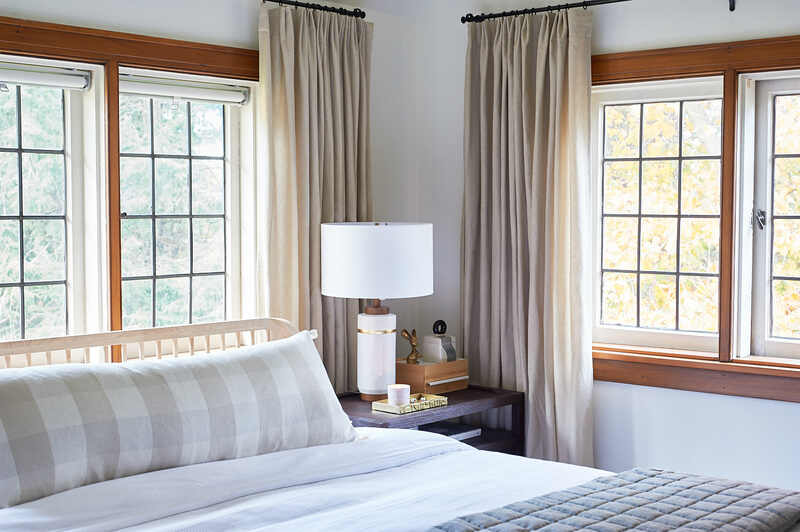 Just like in our guest bedroom, our master bedroom works best with a layout that places the bed under/in front of the windows. 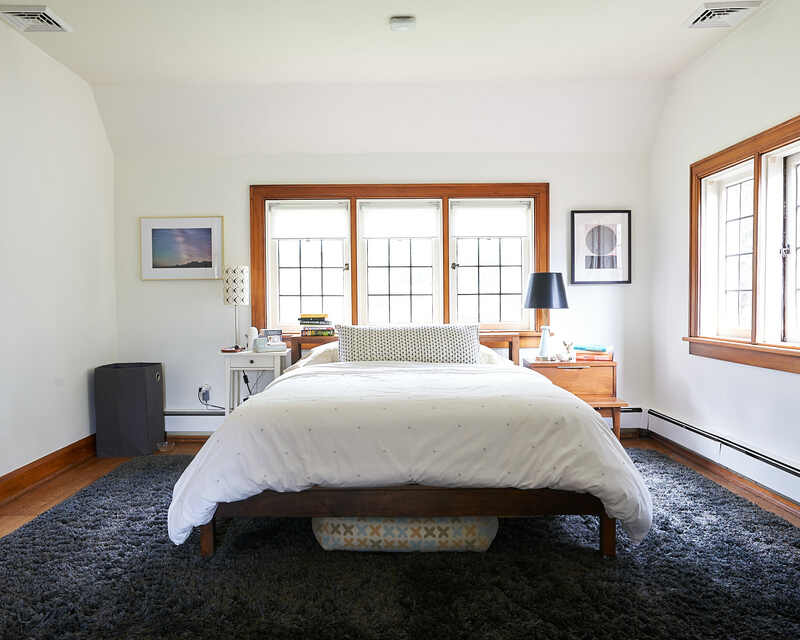 The trick for placing a bed in front of a window and having it look intentional is picking the right bed or headboard. A piece that lets the light shine through (think spindles in wood or metal or a woven rattan headboard) will complement the windows. Alternately, you can choose a low bed or headboard that hits just under the window or at the same height as the window sill. 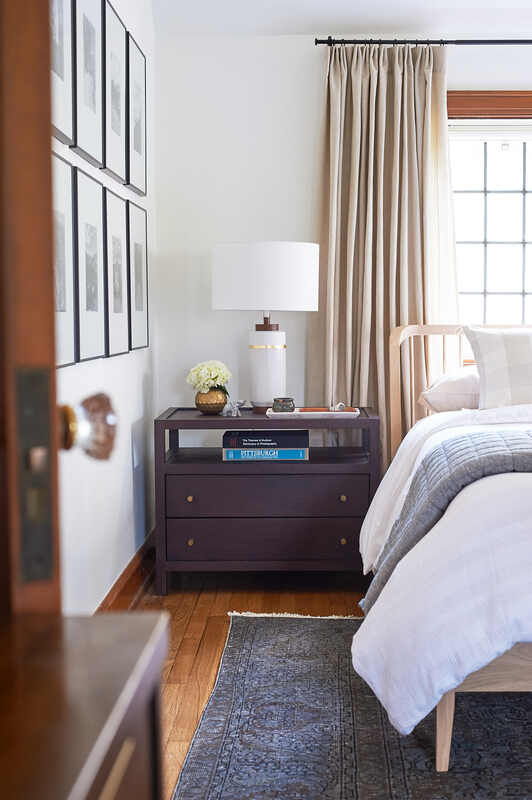 I have wanted the Perkins Spindle Bed from Rejuvenation since I first saw it in Emily Henderson’s bedroom reveal. I chose the white oak because I wanted to add lightness and contrast between wood tones and in this room. A new king-size bed means a new mattress and there are so many mattress-in-a-box companies to choose from! We picked the Leesa Sapira mattress because I like anything that’s described as luxury. We are really liking it! The bed is dressed in my favorite Target sheets, Dobby Ladder Stripe Duvet Cover, Belgian Linen Quilt, and oatmeal check lumbar pillow from Juniper Studio. 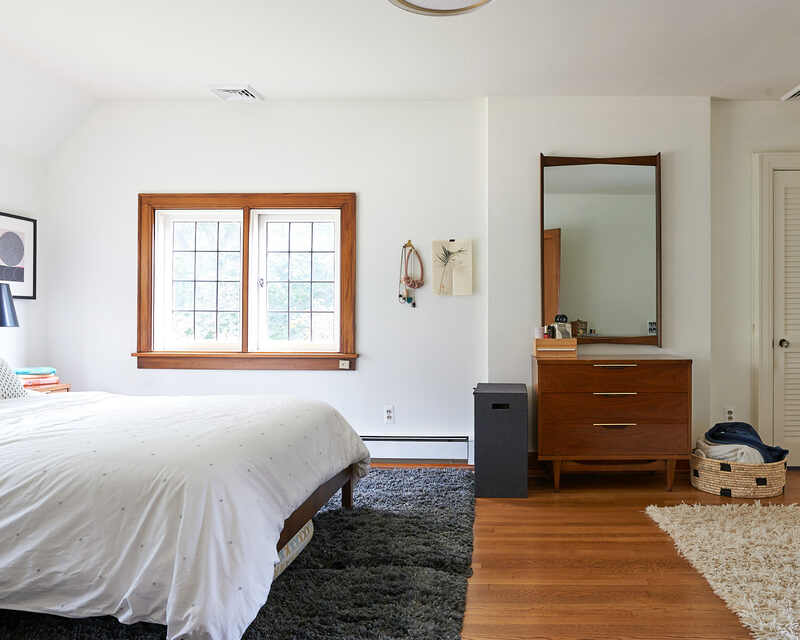 For our new and improved bedroom, I originally wanted 2 rugs for the two “zones” in the room – the bed area and the fireplace area. A few kind internet friends asked me – hey – why not just 1 rug? 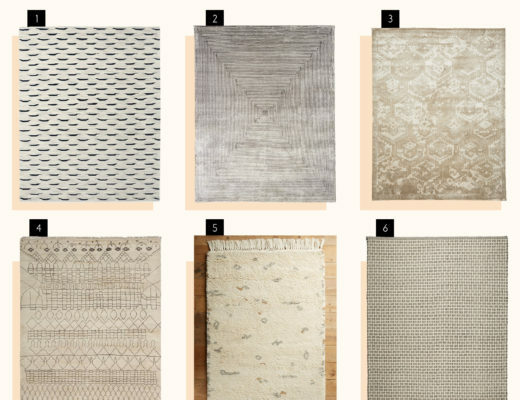 And then I asked everyone to weigh in on stories and the answer was “please, just 1 rug!” So I set to searching the internet high and low for the right giant rug. 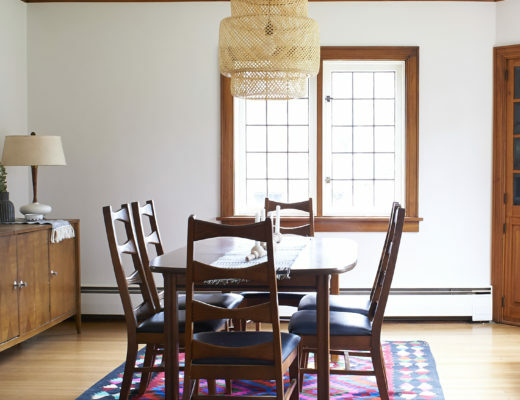 It wasn’t easy but I found a great vintage overdyed rug at my favorite traditional rug source, eCarpetGallery. I still can’t believe we have matching nightstands. For the first time. Our guestroom got a set of matching nightstands in last season’s challenge and now I’m hooked. I’m also hooked on furniture with secret electricity. These nightstands from Crate and Barrel have outlets and USB ports hidden inside a drawer. Technology! Just like last season, I gave IKEA curtains a major makeover just by adding a good pleat. 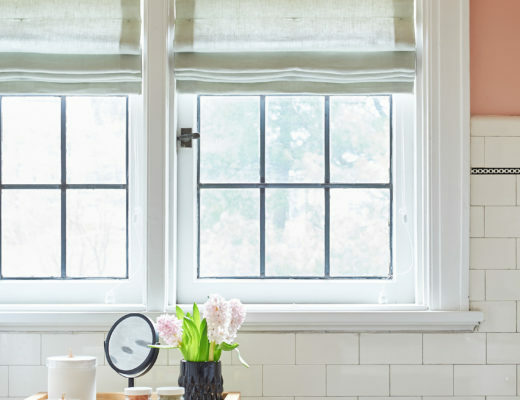 I removed the tabs and sewed a Euro Pleat into basic LENDA curtains to give them a tailored, modern traditional look. They took forever but they were so worth it. For the curtain rods, I chose Pottery Barn’s PB Standard Drape Rods in the .75″ diameter with an antique bronze finish. The finish is nearly black and the brackets have a nice curved shape that echoes the casement fasteners on our windows. If you choose these rods for your home, know that you’ll have to purchase the finials separately, I picked the simple Endcap option. To save some cash where I could, I ordered these curtain rings in black from Amazon which matched the antique bronze finish extremely well. I ended up removing the clips (but keeping the wire hooks) from the rings and attaching them to the curtains using pin-on drapery hooks. Finding the right lamps was another challenge for me. Andy doesn’t like reaching inside a lampshade to turn it on because that’s where spiders live. I wanted something large that was the right scale for the large nightstands and big king bed. It was a challenge to find lampshades that weren’t too bright white or weren’t too close to the color of the curtains. I ended up finding these Roar + Rabbit lamps at our local West Elm just in time and am so happy with them. They have a crackle glaze that nods to the crackle finish on the fireplace tile AND a little dangle pull that means secret spiders are out of luck. We added a grid gallery to the long wall beside our bed using black and white prints of our travel photos and frames from Amazon. We had the oversized mats custom cut to add extra breathing room around the prints. It can be hard to figure out what to do with a big blank wall like this but a tidy, monochromatic grid can make a big impact. 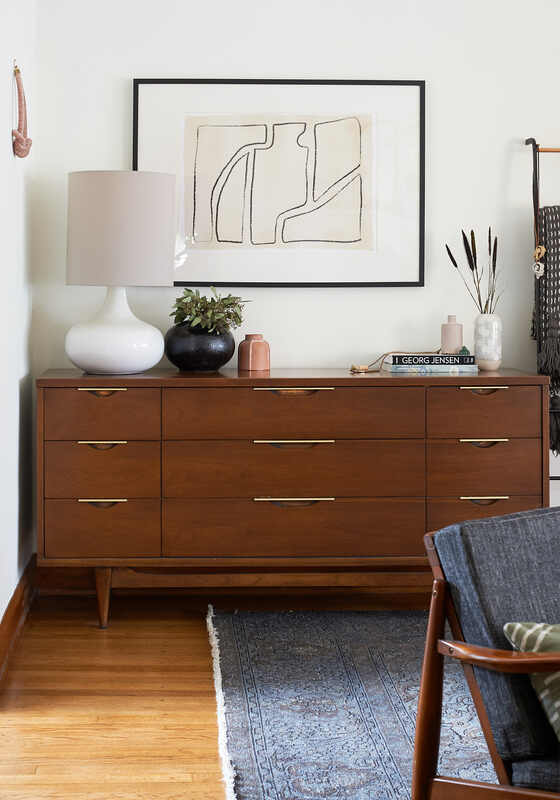 We are still shopping for a new dresser for Andy (we love this mid-century piece by Kent Coffey but are looking for something with larger drawers) but gave this side of the room a little bit of a spruce up. I put together a quick and easy DIY art project by sketching out art on my iPad, having it printed at FedEx Office, and popping it into an IKEA frame from our dining room. Sorry, dining room. The lamp is from CB2 from a few years ago and the vases are both from Target. The blush necklace on the wall is from Sasha. 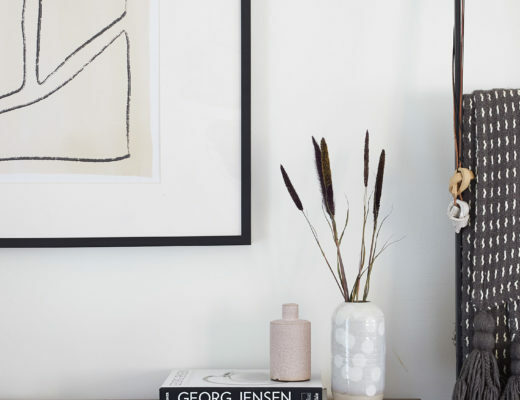 The small pink vase is from Bombabird and the taller spotted vase is from Studio Arhoj. 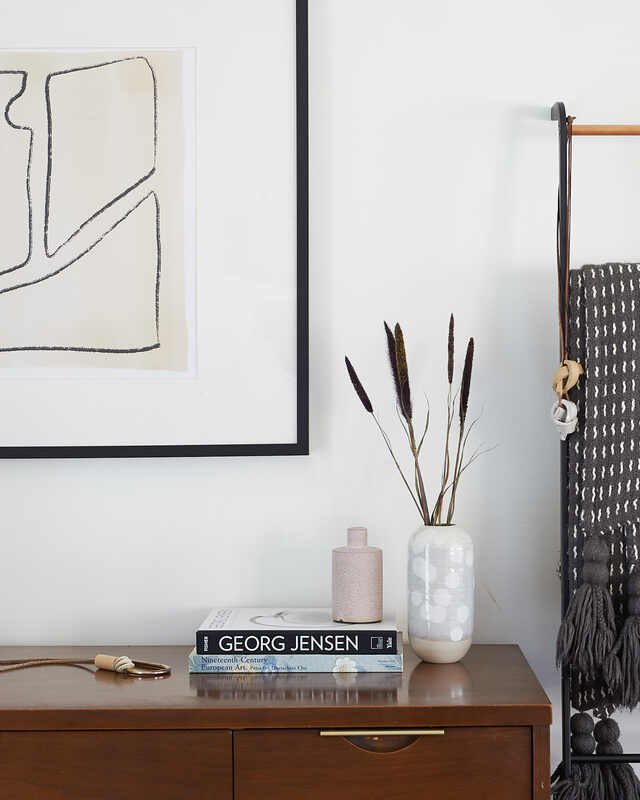 I borrowed the blanket ladder from our guest bedroom and hung some of my favorite ceramic knot necklaces on it from Oatmeal. I am so in love with our new master bedroom. While we didn’t make huge changes with the wall color or layout, we now have a room that is much cozier. Our bedroom felt large and empty before but now feels comfortably furnished. I’m so glad I was also able to bring in some of my favorite vintage accessories to round out the space and add age to the room. Remember to check out the Featured Designer reveals as well as the Guest Participants reveals! It’s so beautiful, Emily! 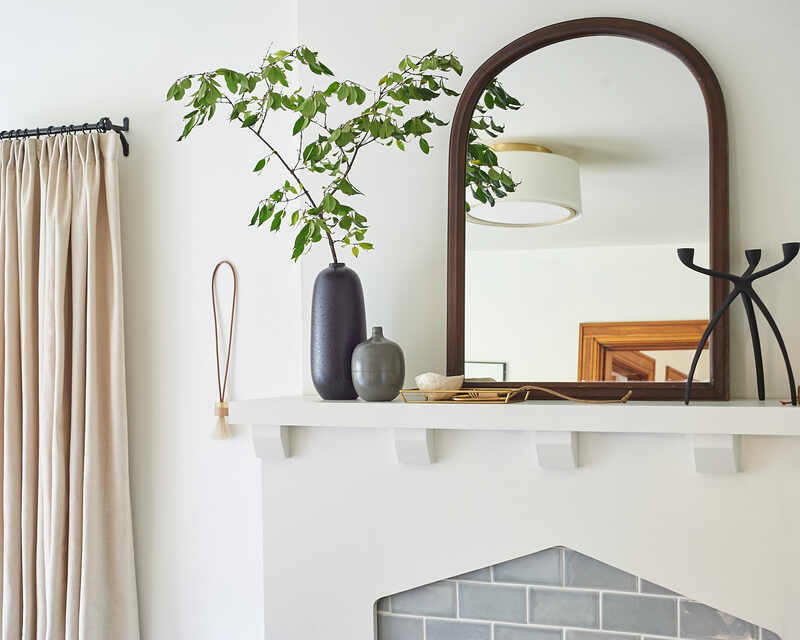 That fireplace…swoon! I also really love the curtains, they look so lux. Well done! p.s. you are QUEEN of the linkup! Thanks so much, Cathy! I love how the curtains turned out too! Haha, yep I’ve got a pretty fast click and paste. Haha, she IS! Every week, there she is in the number one spot, and I’m lucky to be in the 40’s or 50’s. So slow. But your room looks amazing Emily! Love how the fireplace turned out. Love everything about it. You went above and beyond! Amazing job – wish it was my bedroom :). Wow! I poured my heart and soul into our bathroom for (more than) six weeks, but your space is still my favorite! Great job! Oh my gosh that’s so sweet. Thank you! It turned out beautiful! I can’t believe you built a fireplace for your ORC – that is so ambitious and it is perfect. Congrats on your new space. Thank you! The fireplace was a huge feat to attempt in 6 weeks and I’m still surprised we got it done! Your mantel turned out beautifully. The bedroom looks beautiful. I absolutely love it! That fireplace turned out incredible! Congrats!!! gorgeous bedroom makeover and yay to the matching bedside tables and lamps! love your styling and great job with the curtains!! This looks amazing! I loved last years reveal so I was looking forward to this years! You have done it again girlfriend! Love everything about this! That rug! 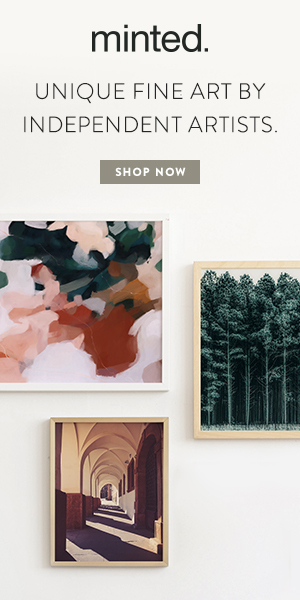 Is it crazy that I am in love with that little faceted drink table? Congrats on another fantastic ORC! Wow! Love the addition of the fireplace. It’s all so beautiful. I still can’t believe you built a fireplace. Who does that? Way to go! It looks spectacular! The fireplace was such a good idea. It looks like it’s been there all along. And that bed…I love your room! It’s amazing, Emily! You always kill it. 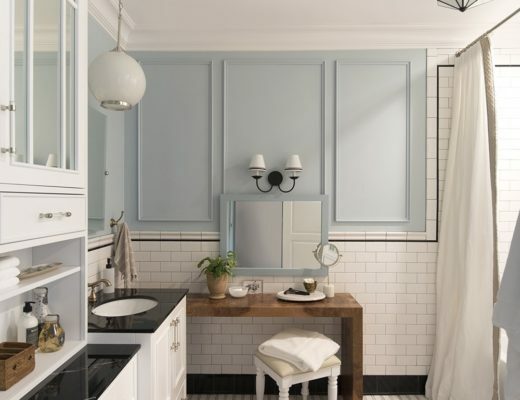 That tile is absolutely gorgeous. Congrats on a job very well done! The fireplace is such a great touch! Absolutely beautiful! You guys did an amazing job on the fireplace! This is gorgeous Emily! Love the space it feels cozy and romantic! I can’t get over how beautiful that fireplace is! I made over our master as well but am still feeling some pangs of jealousy for this room. I love everything you do! I love the idea of adding pleats to make curtains more custom. I’m thinking a fireplace in our bedroom might be just what we need. Awesome job! Really love the transformation. Brava, Emily! Your bedroom is one of my very favorite projects from the challenge. You did such a great job pulling everything together. You have a gift. It’s so, so good, Emily!!! I am so impressed by the fireplace and your styling!!! And that curtain treatment, love that! The fireplace looks stunning! ORC job well done!